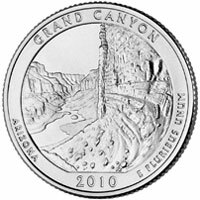 The Grand Canyon National Park quarter is the fourth of 2010 and the fourth overall in the America the Beautiful Quarters™ Program. A powerful and inspiring landscape, the Grand Canyon overwhelms the senses through its immense size – 277 river miles long, up to 18 miles wide and a mile deep. The Grand Canyon was first established as a national site on February 20, 1893 (27 Stat. 469). The reverse image features a view of the granaries above the Nankoweap Delta in Marble Canyon near the Colorado River. (Marble Canyon is the northernmost section of the Grand Canyon.) Granaries were used for storing food and seeds (A.D. 500). Inscriptions are GRAND CANYON, ARIZONA, 2010 and E PLURIBUS UNUM. Design candidates were developed in consultation with representatives of Grand Canyon National Park.